In the Store configuration page, the Location/URL chooser displays wrong labels in the drop down menu. 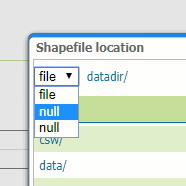 There is a "file" and then all "null" instead of "Home Directory", "Data Directory" "/" etc.. etc.. This bug happens both in Linux and Windows.